When you think of what a guy does on Super Bowl Sunday, you get a certain mental image. He would prepare some snack foods for the big game, stock up on last minute necessities for the big game, and then watch the big game. Basically, his entire day will revolve around the football game. That’s the stereotype, but my “Super Bowl Sunday” was anything but stereotypical. The day began, as any Sunday would, with the boys waking up while B and I were still trying to sleep. They got themselves into the living room and began playing. After, I dragged myself out of bed to get them breakfast, NHL began to complain about being cold. Despite being wrapped up in my Slanket and a second blanket, he was still cold. I noticed that the air *did* seem unusually chilly. A quick check of the thermostat confirmed that something was wrong. While it was set to set to 63°, it read 59°! I checked the boiler and noticed that the pilot was out. When I tried to re-light it, it wouldn’t stay lit. I knew, then, what the problem likely was: a bad Thermocouple. We had just replaced it two or three weeks ago, but it was the most likely culprit. For those who don’t know, the thermocouple is a small sensor that tells the boiler or furnace whether the pilot is still lit. If the pilot goes out, the thermocouple makes sure that the gas is automatically turned off so the house won’t explode. Very nice feature, except that it tends to fail often for us and, when it fails, the gas turns off unexpectedly. What should have been a normal get-NHL-ready-for-Hebrew-School Sunday morning turned into a get-everyone-out-the-door-so-I-could-fix-the-heat Sunday. A couple trips to Home Depot later (my fault for getting the wrong length thermocouple) and we had heat again. Then, it was time for some shopping. But I wasn’t on the hunt for chips and dip, but for ingredients to use for the week’s dinners. After picking up NHL from Hebrew school, returning home, and feeding everyone lunch, I caught the baking bug. Very soon, I had made brownies for everyone. (Part of my motivation may have been that the brownie mix had reached its “Best By” date and I wanted to bake the mix and not toss it.) I also took some time to sew some buttons back on a few items of clothes that needed it. Once the brownies were done, the baking bug was out of my system but the cleaning bug took over. I trotted out the vacuum cleaner and became determined to make it reach into crevices that are easily overlooked during our usual house cleaning. By the time I finished with that, it was time to start making dinner: Black bean soup with diced tomatoes, sliced mushrooms, and diced zucchini. Baking, cooking, sewing, vacuuming, and grocery shopping. This definitely wasn’t your stereotypical “guy’s Super Bowl Sunday.” Then again, I pride myself on being anything but stereotypical. 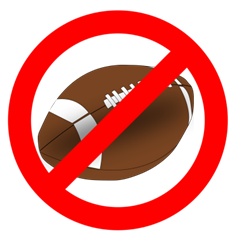 Disclaimer: The image above is based on “Football” and “No-sign” from OpenClipArt.org.